A neighbor tipped me off to a deal at Buffalo ReUse the other day, an incredible price on plywood - $8/sheet. 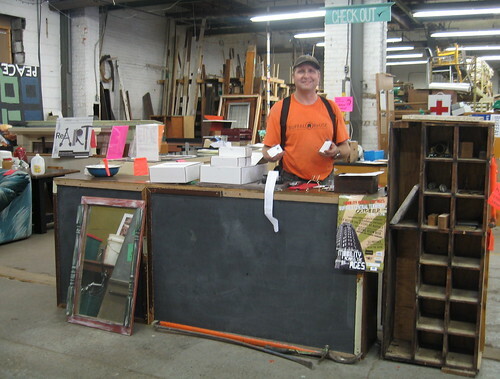 So I stopped over to the store at 298 Northampton Street and stocked up for a number of projects. Kevin Hayes, the store manager, showed me his new business cards that had just been delivered. If you haven't stopped by and checked out the deals you should before you head off to any of the traditional retail outlets for building products. 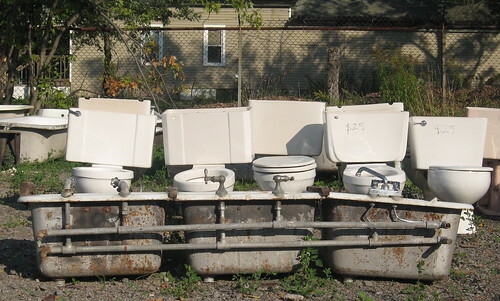 I spotted this amazing laundry tub out back. I had a chance to talk with these two ReUse customers who are opening a vegetarian restuarant on Delaware Avenue in the spot that used to be one of my favorite local bars, Prespa. Here, they're picking out some reused shelf brackets for their new business. Kevin reminded me that in a few short weeks, Buffalo ReUse will be hosting the 2008 Great Lakes ReUse Conference. Youngstown, OH Mayor Jay Willams will be one of the keynote speakers. I first mentioned Jay Williams - Visiting Youngstown - in a series of posts last year. This should be an amazing event. Buffalo Ideas is a daily read. Paul Wolf, the blog's author, was formerly the Common Council's Chief of Staff and is currently General Counsel at the Buffalo Municipal Housing Authority. One of Paul's recent posts - Let's Talk about Leadership - is a short review of Barbara Kellerman's book, BadLeadership - What it is, How it happens, Why it matters. Paul has a loyal following and is the only person I know in local public service who blogs. If you know of anyone else in local government who blogs, please send me the site. Thanks. When I bought a neglected and vacant row house in the City's Cold Springs neighborhood 12 years ago I developed an interest in the remaining sets of row houses in the area. The Emerson Row and the Woodlawn Row (then occupied) were just a block away and were the last remaining row houses in the immediate neighborhood, a neighborhood that once contained 15 sets of row houses and maybe the largest concentration of this type of housing in the City - see map. Fifteen sets had dwindled to three. A fixBuffalo reader sent the following link this morning to another set of row houses, a few blocks away at the corner of Laurel and Michigan. 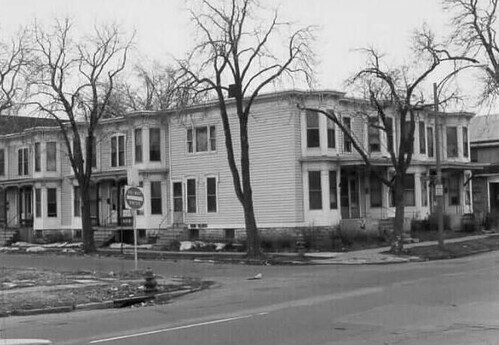 I remember this row and despite it's successful nomination and placement on the National Register and its designation as a local landmark, it was demolished in 1997. I re-read the nomination package for this property recently and was struck by the high level of architectural detail that was described. The wrapped 'L' shape was unique. I also remember riding past this corner one morning 11 years ago wondering why construction crews were out shortening and shrinking the window openings. I called the building inspector and asked if a permit had been filed and whether the Preservation Board had approved the exterior changes. A permit had been approved for the window shortening. This was probably my first direct lesson in the lack of institutional oversight and protection for the City's architechural and cultural heritage. Years later I learned that the Woodlawn Row experienced the same City Hall disconnect as building permits were approved on two occasions for exterior work - here and here - without the Preservation Board's approval for the installation of blue vinyl siding. I spoke with a neighbor of mine later this afternoon about the 'L' shaped row at Laurel and Michigan. She told me that after a series of drug busts three bodies were found in the vacant structure, the place was demolished. This morning I met a couple fixBuffalo readers and walked the Artspace Neighborhood. 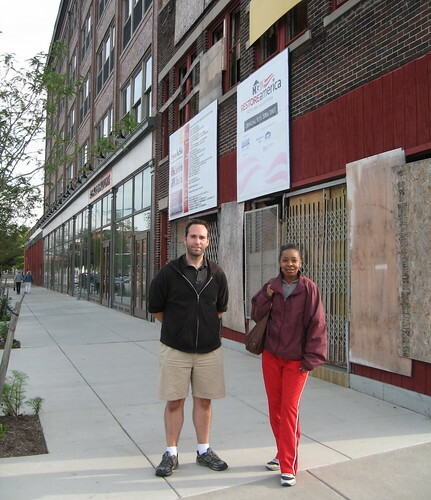 Since Artspace plans were finalized in February of '06 the neighborhood has attracted a significant amount of attention. There are now major residential renovation projects happening on every block. I'll keep track of my Saturday morning pics - Walking around Artspace - and update the series every two weeks. Here's the schedule for the rest of 2008, rain or shine. Meet-up is at the Sonice Cafe at 9am, right across from Artspace. Here's the map. The E & B Holmes building, in Buffalo's first ward, caught my eye years ago - google map. I just learned about the following media advisory from a fixBuffalo reader. 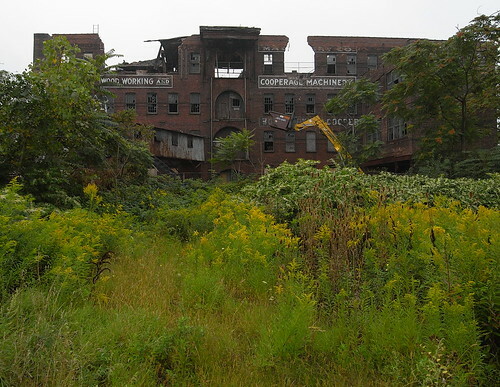 Wednesday, September 17, 2008 at 4:00 p.m.
An important announcement by the Preservation League of New York State and others regarding the rehabilitation of the historic E & B Holmes Machinery Co. on the Buffalo River waterfront into residential market-rate lofts and commercial space. Here a few pics I've collected and a link to additional information about the building. 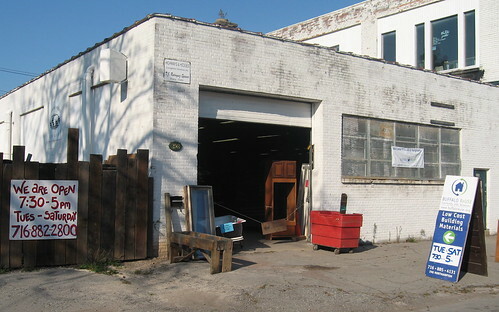 The following photo appeared in this Buffalo Rising post about the Cooperage. Check out the website when you have a moment - River Lofts Buffalo. I entered Our Lady of Lourdes for the first time shortly before 11am this morning. I was speechless. After walking around for a few minutes and taking the following pics - see slide show - I heard Cash Cunningham read the terms of sale and a few minutes later the auction opened at $100,000. After reminding the 50 people in attendance that the location of Our Lady of Lourdes is unique - sandwiched between the medical corridor and new development on Main Street including Artspace - the auction very quickly bottomed out at $25,000, with only one person bidding. It's not clear at this time what the new owner has planned for the church. 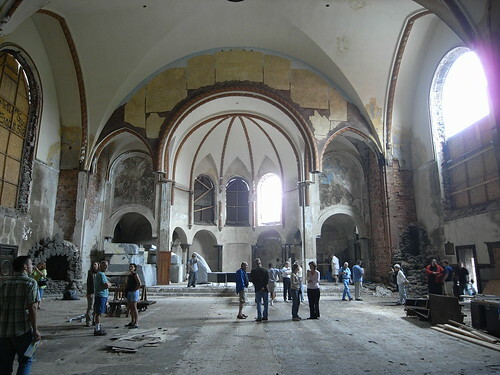 What is clear is that 15 years of neglect, on every possible level, has ruined an amazing architectural and cultural treasure. In July I had the opportunity to attend a reception at Artspace where Senator Hillary Clinton spoke. At the time i was struck by the following lines from Hillary's address. A couple hundred long time Artspace supporters and residents gathered on a spectacular summer afternoon. Laura Krolczyk, from Hillary's Buffalo office just sent this along. Thanks Laura. I spoke with Paul McDonnell this morning. He's an architect for Buffalo's Board of Education and the liasion between the Board, Ciminelli and the Joint School Reconstruction Project. He told me that the ground breaking for this 40m project took place a month ago. 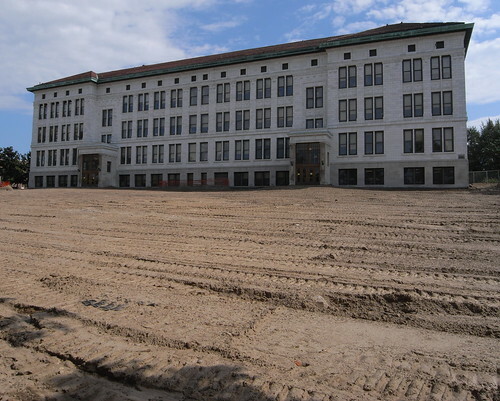 The school is scheduled to re-open in September 2010. I learned from Paul that what I had mistakenly reported as the ground breaking in late June - here - was actually activity related to the excavation of the last human remains from the long abandoned Potter's Field Cemetery. So here's my first re-construction photo which shows the former front lawn, along Best Street, and the location of the two new additions. 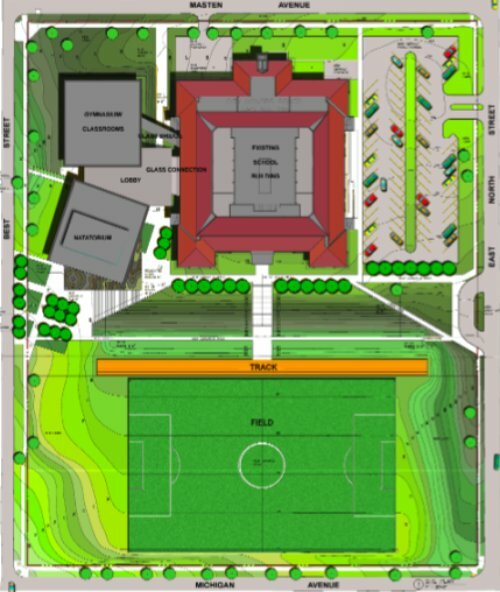 Two new additions are planned, a gymnasium and an all-high pool. As you can see from the rendering, from Buffalo's Hamilton Houston and Lownie, the new Fosdick Masten Field will replace a cluster of poorly constructed multi-family structures operated by BMHA are known as Woodson Gardens. 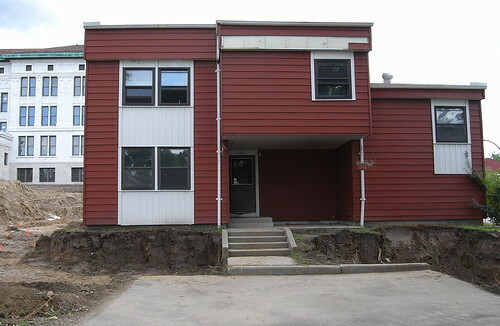 According to Paul McDonnell this single family house, owned by BMHA, has been scheduled for demoltion. Negotiations for the demolition of the entire Woodson Gardens complex are on going, according to Paul. Check out the City Honors archive for additional information and regular updates. I caught up with JM Reed the other day and he wanted to make sure that fixBuffalo readers see what's beginning to happen on Coe Place. He picked up the new listing for 25 Coe Place, right here. 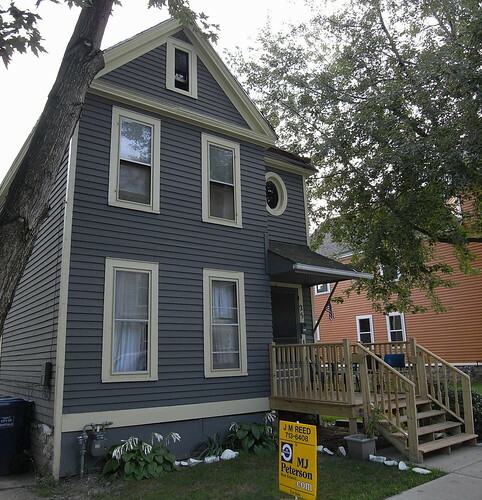 Asking price for this existing two family house is $64,900. If you haven't walked the neighborhood along Coe Place in the past year, you're in for a few surprises. The pace of renovation has picked up significantly and a number of individuals are seeing the area around Artspace as the next new neighborhood; an emerging destination just off Main Street, near transit and sandwiched between the Medical Campus and Canisus College. Interested in the neighborhood? Contact JM for further information - J-M Reed/ Broker Associate MJ Peterson, 431 Delaware Avenue Buffalo, NY 14202 • 716 713-6408 jm@reedsalesco.com. For additional information about Coe Place check out my early posts, here. Here's the Saturday morning Artspace neighborhood schedule for the Fall. I'll be leading these neighborhood walks on the first and third Saturdays of the month. Meet-up is at 9am inside the Sonic Cafe right across from Artspace. Plan on being out and about for an hour - rain or shine. Here's the link to last year's Saturdays around the neighborhood and the map for this season. If you're interested in additional information check out two sections of my 'Building & Issues Index' - Coe Place and Artspace. This Saturday at 11am Our Lady of Lourdes will be auctioned. Here the details from Cash Cunningham's site. 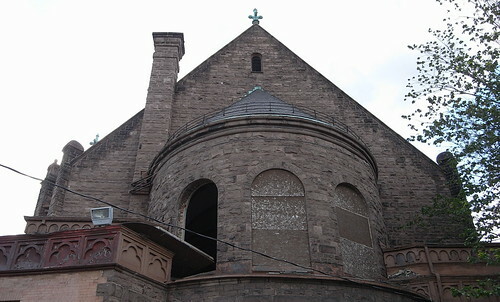 Our Lady of Lourdes was one of the first Catholic Churches sold off by the Diocese back in the 90's and is located on Main Street just a few blocks south of Artspace, at Best Street. I noticed this afternoon that at least one of the boards securing a window in the church's apse had been removed. 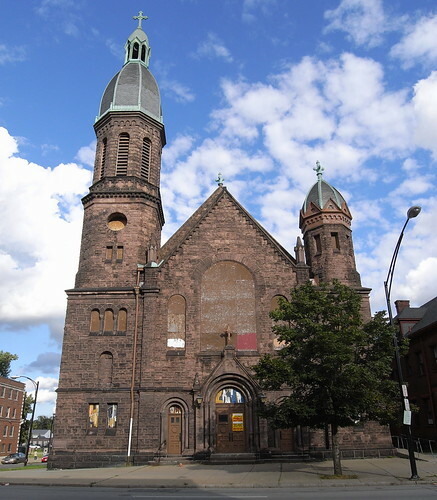 George Thomas Apfel, a former Lourdes parishoner, has provided additonal details about the church and the social history of the parish - here and here in two recent Buffalo Rising posts. Additional pics are available here on his website. 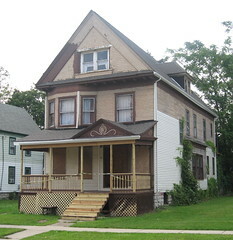 According to City of Buffalo records, the current owner purchased the property three years ago for $65,000. When I peeked through the front door, the interior looked like a disaster. A number of long time residents next door told me that the place has been vacant for at least 15 years. Make sure to check out the 10 additional real property auctions that Cash is holding here in Buffalo and Lackawanna on Saturday, September 13th. Abandoned Housing Crisis - Solutions? Today's Buffalo News carried the following announcement that may be of interest to fixBuffalo readers. 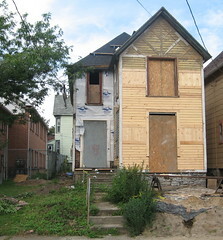 “Buffalo’s Abandoned Housing Crisis: New Solutions” will be the subject of a panel discussion at 4 p. m. Sept. 17. It will be presented by the Partnership for the Public Good. The panelists will be Anthony Armstrong, Local Initiatives Support Corp.; Harvey Grant, West Side Community Collaborative; Kathleen Lynch, Western New York Law Center; Sam Magavern, University at Buffalo Law School; Judge Henry Nowak Jr., Buffalo Housing Court; and Brian Reilly, commissioner of economic development, permits and inspections. The 90-minute event will be held at Cornell University Industrial and Labor Relations School, Suite 1200, 237 Main St. It’s free and open to the public. To guarantee a space, register by Friday by sending an e-mail toklc27@cornell.edu. If there's a podcast, I'll make sure to follow-up with another post. I had a chance to catch up with Anthony Armstrong - LISC Buffalo - recently for the latest numbers in what's become the leading indictor of vacancy and abandonment here in Buffalo, NY - the quarterly HUD/Postal Service data indicating the trends around undeliverable addresses. The staggering data sets - see spreadsheet - are clearly depicted here in these two graphics that Anthony has prepared. That spread sheet is organized by census track for Buffalo and includes data on surrounding towns, too. Both pics, representing numbers at the end of the second quarter - June '08 - clearly show what's happening and how the city's neighborhoods are hollowing out. The first pic is the current snap shot and the second shows the changes over a four year period, 2005 - 2008.
click here for larger image of first pic, click here for larger image of the second. Links to Anthony's previous work is available here - Undeliverable and Unbelievable - Unstoppable? - from this past June. If you're a new reader or old, I'd like to know what you think of these trends and what's happening, or not, in your neighborhood. A fixBuffalo reader tipped me off to this past weekend's Smart City broadcast. Harvard University's Ed Glaeser was the first guest. I've frequently posted about Glaeser's work - Resurecting Buffalo - and his recent visit to the Queen City. Here's the recent podcast where Glaeser weaves his take on Buffalo into a larger discussion about what makes cities work. The program is hosted by Carol Coletta.